Colonel Moultrie and Colonel Thomson were conferring at Breach Inlet on the morning of the invasion. 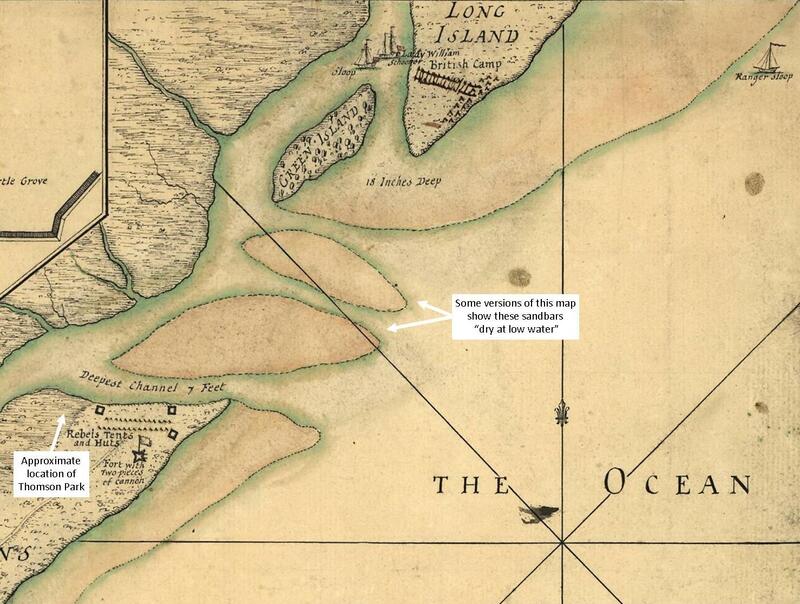 About 10:30 am, they noticed British boats around Long Island preparing for battle. Colonel Moultrie galloped back to Fort Sullivan to lead his troops against the British navy, and Colonel Thomson rallied his troops against the British army. As the tide rose, the attack across the inlet began with mortar and cannon fire from British artillery on Green Island and the oyster bank redoubt. Gunfire from supporting warships also covered the crossing. General Clinton said, “I made every demonstraton every diversion by Cannonade, while the Sands were Uncovered.” The Americans returned fire with their two or three cannons. The enemies would exchange artillery fire thoughout the day and into the evening, yet the British did not realize that the patriots nearly ran out of ammunition. South Carolina Chief Justice Drayton wrote that at 10pm, they had only one cartridge in the 18 pounder and only two or three charges for the other cannons. As the Americans waited for the amphibious crossing, British foot soldiers launched a surprise attack across the creek on the mainland (west) side of Sullivan’s Island (now named Conch Creek). They reportedly approached as close as 60 yards. At that distance, the British muskets were no match for the American rifles which were effective at longer range. A soldier in Thomson’s 3rd Regiment described the engagement: “Our rifles were in prime order, well proved and well charged; every man took deliberate aim at his object, and it really appeared that every ball took fatal effect. …the proportion, which fell, never to rise again, was very great. The fire taught the enemy to lie closer behind their bank of oyster shells, and only to show themselves when they rose up to fire. …although they were reinforced, and their dead and wounded carried off, their numbers diminished very fast, until in the space of an hour they ceased to fire altogether.” The ground attack in support of the crossing was over. The channel near Sullivan’s Island was too deep to ford and waves and shoals made landing in the surf or crossing at the mouth of the inlet impractical. The British planned to ferry the infantry across in boats from the creek on the mainland (west) side of Long Island, beyond the bridge now spanning the inlet. They had 15 armed flat-bottom boats to carry 600-700 men per wave. The infantry loaded into the boats and started across, cheered by the redcoats remaining on shore. A narrow channel and shoals limited them to crossing in a line, nearly single-file. Thomson’s sharpshooters waited until they approached Sullivan’s Island, then raked the decks with rifle fire and grape shot from the cannons. A loyalist aboard the British schooner stated, “It was impossible for any set of men to sustain so destructive a fire as the Americans poured in …on this occasion.” General Clinton said only, “I ordered small armed vessels to proceed toward the point of Sulivan’s Island, but they all got aground.” Patriot leader Richard Hutson wrote, “…the eighteen pounder with grape shot spread Havock, Devastation, and Death, and always made them retire faster than they advanced.” The flotilla dispersed under the heavy, deadly American fire. Eyewitnesses reported that the British repeatedly attempted to cross, but they were unable to establish a beachhead on Sullivan’s Island. Hutson observed, “There was not a single Man killed on our side at the back [side of the island], and but one wounded. It is imagined the enemy left a great Number there.” No casualty report can be found in the voluminous papers of General Clinton or other British officials. Surveying the untenable situation, General Clinton wisely decided to abandon the crossing and save his men for future battles. The crossing was denied. 3000 British on Long Island had been defeated by 780 patriots on Sullivan’s Island!